Authors: Jadidi, M. M.; Sushkov, A. 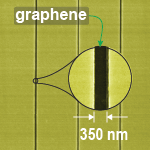 B.; Myers-Ward, R. L.; Boyd, A. K; Daniels, K. M.; Gaskill, D. K.; Fuhrer, M. S.; Drew, H. D.; Murphy, T. E.
Abstract: We report here a new type of plasmon resonance that occurs when graphene is connected to a metal. These new plasmon modes offer the potential to incorporate a tunable plasmonic channel into a device with electrical contacts, a critical step toward practical graphene terahertz optoelectronics. Through theory and experiments, we demonstrate, for example, anomalously high resonant absorption or transmission when subwavelength graphene-filled apertures are introduced into an otherwise conductive layer. These tunable plasmon resonances are essential yet missing ingredients needed for terahertz filters, oscillators, detectors, and modulators.